This article discusses the magazine Der Dada No. 1, published in 1919 by Raoul Hausmann and Johannes Baader, arguing that a central concern throughout the issue is the future and its manifest uncertainty. Der Dada No. 1 presents us with a historically specific way of thinking about futurity as such, a relationship to the future that exploits its inherent uncertainty for financial gain. Most crucially, Hausmann and Baader reveal how this speculative stance extends beyond the financial realm, ultimately encompassing all facets of the future, so that the most any individual can hope for is not to change the course of history, but merely to game the system. While hyperinflation was still a few years off when Der Dada No. 1 appeared in June 1919, inflationary rumblings had already begun, and Hausmann and Baader aptly assessed their implications. What they portray in Der Dada No. 1 is an attitude towards the future defined by speculation and uncertainty; a background against which Dada is proffered, ironically, as the only reliable investment. 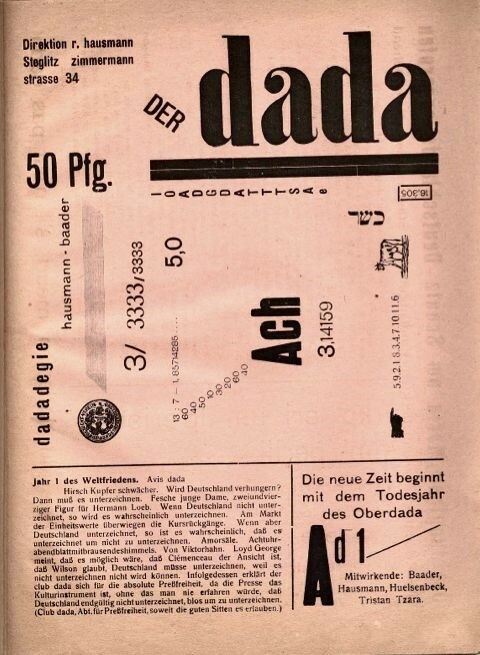 In June 1919, shortly before the signing of the Treaty of Versailles, the Berlin Dadaists Raoul Hausmann and Johannes Baader published the first issue of their magazine Der Dada. Although it comprised a mere eight pages, Der Dada No. 1 was hardly thin on ambition. Like the treaty itself, the magazine claimed to usher in a new era: Its first page proclaimed, “Die neue Zeit beginnt mit dem Todesjahr des Oberdada,” a reference to Baader, who had intentionally fed false rumors of his own demise to the German press (Fig. 1). From the very beginning, then, this magazine presented itself as a decisive break with the past, and heralded a radically different future. On subsequent pages, the magazine tackled topics ranging from politics to economics to religion, its tone veering from the polemical to the plainly satirical, punctuated by non-sequiturs, chaotic typography, and Hausmann’s rough-hewn woodcuts. One common thread amidst this diversity was a concern with the future, and above all with its manifest uncertainty. As the present article will demonstrate, such uncertainty gave rise to a distinctive attitude towards the future that can be recognized throughout the issue: an attitude of speculation. In referring to speculation as an attitude, I mean to echo Foucault, who famously characterized modernity “rather as an attitude than as a period of history”—not as an epoch, but as “a mode of relating to contemporary reality” (39). In a similar way, I will argue, the “futurity” of Der Dada No. 1 is tied not to any specific years that loom on the horizon, but rather to a particular mode of relating to future realities. Specifically, the attitude that pervades Der Dada No. 1 is one that exploits the future’s inherent uncertainty, treating the future as such as a field for speculation and profit, transforming the future into futures. Figure 1: The front page of Der Dada No. 1. This is not to say that the magazine advocates or endorses this speculative stance; on the contrary, Hausmann and Baader consistently subject this attitude to critical examination and parodic exaggeration. Most crucially, they reveal how the attitude of speculation quickly extends beyond the financial realm, ultimately encompassing all facets of the future, so that the most any given individual can hope for is not to change the course of history, but merely to game the system. More than two decades later, in an address entitled “Inflation: The Witches’ Sabbath: Germany 1923,” Thomas Mann would recall the speculative attitude that had proliferated during the hyperinflation of the early 1920s, describing how Germans “learned to look on life as a wild adventure, the outcome of which depended not on their own effort but on sinister, mysterious forces” (qtd. in Widdig 10). While such hyperinflation was still a few years off when Der Dada No. 1 appeared in June 1919, inflationary rumblings had already begun, and Hausmann and Baader aptly assessed their implications, not only for Germany’s financial future, but for the future as such. What they portray in Der Dada No. 1 is an attitude towards the future defined by speculation and uncertainty—a background against which Dada is proffered, ironically, as the only reliable investment. ‘Chicago Tribune’ meldet, heute nacht sei in Paris eine geheime Meldung eingetroffen, daß Deutschland den Vertrag unterzeichnen werde. Das Blatt erfährt aus bester Quelle, daß Clemenceau, Lloyd George und Wilson keine Fristverlängerung auch nur um eine Minute gewähren wollen, außer wenn Deutschland das Versprechen abgibt, daß der Vertrag unterzeichnet wird” (“Die feindlichen Blätter meinen… 1). Unsurprisingly, this atmosphere of uncertainty and suspicion is a primary target of satire in Der Dada No. 1. At the bottom of the issue’s front page, a brief, unsigned article predicts: “Wenn Deutschland nicht unterzeichnet, so wird es wahrscheinlich unterzeichnen. […] Wenn aber Deutschland unterzeichnet, so ist es wahrscheinlich, daß es unterzeichnet um nicht zu unterzeichnen” (Fig. 2). The object of mockery here is not the treaty itself, but rather the rampant, inconclusive, and futile speculation surrounding it. This passage reduces all such speculation to paradox and contradiction, evoking a sense of helplessness in the face of uncontrollable circumstances. For the average German, this brief article suggests, the treaty negotiations appear irrational and their outcome fundamentally unknowable; no longer even a topic of well-informed debate, the treaty can only be a matter of conjecture. Figure 2: Detail from the front page of Der Dada No. 1. At times, the issue’s rhetoric turns more sharply against the treaty: a piece signed by Baader, for instance, refers to “die Komödie der Friedensvertragsüberreichung” and declares “daß die Posaunen dada in der Tat die Posaunen des Weltgerichts sind. Des wirklichen Weltgerichts; nicht der Harlekinade von Versailles” (Baader, “Venit creator spiritus . . . . . dada” 5). For the most part, though, the dominant tone is one of ironic distance, as reflected in Hausmann’s declaration: “Wir brauchen keinen Standpunkt für oder gegen Versailles einzunehmen. Dieser Friede ist die zweite Etappe des Unvermeidlichen” (Hausmann, “Alliterel” 3). This assertion highlights the political consequences of a speculative stance towards the future. On the one hand, as the article on the front page indicates, the future is not wholly knowable; if it were, it could not be the object of speculation. On the other hand, though, as Hausmann suggests, the future is not within the power of any ordinary individual(s) to control; any opinion on the treaty, pro or con, is rendered moot in the face of the inevitable. If this speculative streak is evident in the issue’s approach to politics, it is all the more apparent in several texts that highlight economic instability and financial uncertainty. The same front-page article that speculates about the Treaty of Versailles begins with the line: “Hirsch Kupfer schwächer,” a reference to Hirsch Kupfer- und Messingwerke AG, a metal producer that had profited from the war, and consequently stood to lose from the peace. The implications of Versailles for industry and finance are thus made apparent from the start, and echoed a few sentences later: “Am Markt der Einheitswerte überwiegen die Kursrückgänge.” Here the uncertainty that pervades the issue’s other texts emerges in its purest—financial—form, as the markets are shown to be subject to the vicissitudes of international politics. A few pages later, this economic volatility is reflected in an advertisement for upcoming issues: whereas issue 1 is priced at 50 Pfg., issue 2 will cost one mark, and issue 3 one mark fifty, apparently in anticipation of drastic inflation (Fig. 3). It would be tempting to take this as yet another ironic gesture, except for the fact that issue 2, when it appeared in December 1919, actually did cost 1 mark (unfortunately, issue 3 does not display a price). There are other references to irrational pricing as well: a solicitation for advertisers offers a full-page advertisement for 400 marks, a half page for 600, a quarter page for 800, and an eighth of a page for 1000 marks, inverting typical pricing structures. Interestingly, when this same ad ran in the magazine’s second issue, the pricing structure had reverted to a conventional one, suggesting that pragmatic financial considerations may have ultimately won out (Fig. 4). Figure 3: An advertisement for upcoming issues of Der Dada. Detail from page 6 of Der Dada No. 1. Figure 4: “Machen Sie dadareklame!” Details from page 7 of Der Dada No. 1 (top) and page 5 of Der Dada No.2 (bottom). Keynes’ description highlights not only the practical consequences of runaway inflation, but also its psychological effects, the deep-seated sense of uncertainty and powerlessness that it can engender. For Hausmann and Baader, too, inflation takes on a sort of irreality, becoming disconnected from lived experience. Like the political speculation surrounding the Treaty of Versailles, the economic speculation linked to rapid inflation leaves little room for individual agency; the magazine depicts both politics and economics as “a gamble and a lottery,” irrational forces that cannot be controlled, but might, in the best of cases, be exploited for personal gain. The future is transformed into a field for speculation, where sound investment and careful preparation give way to games of chance. In other texts throughout the issue, religion briefly appears to offer refuge from these political and economic uncertainties, but quickly reveals its inadequacy. For example, an article on the second page, entitled “Die Jungfrau Maria um Schutz Deutschlands angerufen” claims that the entire SPD has offered to convert to Catholicism if Pope Benedict XV will intervene in the treaty negotiations to obtain better terms for Germany; however, the article explains, this will only occur if the SPD agrees to elevate the immaculate conception to the official state religion. While this article is a relatively straightforward topical satire, in other articles Dada itself takes on a religious aspect. In one notable instance, a visual riddle on the magazine’s front page—an apparently meaningless series of letters—can be decoded with the help of a numerical key to spell out the phrase “DADA IST GOTT” (Fig. 5). This encoded message offers some promise that even an apparently inscrutable, nonsense text may ultimately yield an unambiguous meaning—an encouraging prospect for uncertain times. 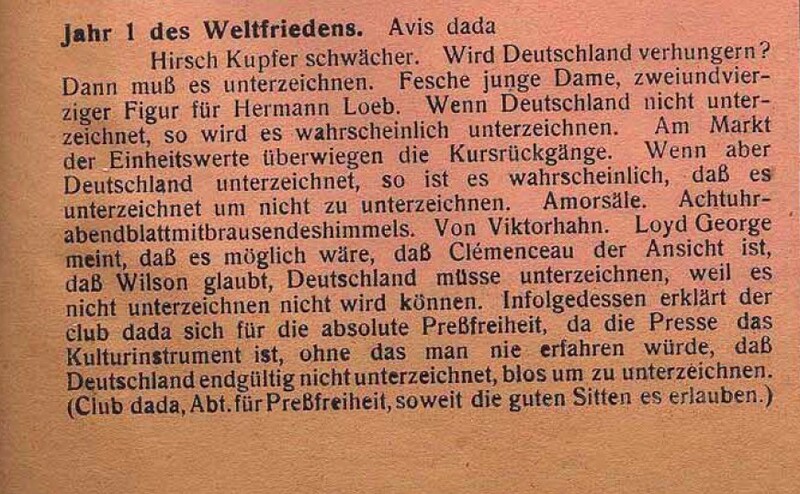 Two pages later, though, an article entitled “Dada-Spiel” declares that “der liebe Gott nur eine dadaistische Fiktion ist,” and continues, “dada ist der Schöpfer aller Dinge und Gott und die Weltrevolution und das Weltgericht in Einem gleichzeitig. […] Und das Spiel, das gespielt wird im Himmel zwischen den Sternen ist das Spiel dada, und alle lebenden und toten Wesen sind seine Spieler.” If the riddle’s solution initially seems to offer certainty, here that confidence is shaken again, as Dada is revealed to be not only God, but also a game in which all beings are merely players. Rather than offering an escape from uncertainty and speculation, Dada is represented here as the apotheosis of those very qualities, equal parts God and game. Only a few years later, in 1926, Albert Einstein would write that God “is not playing at dice” (Einstein 91); in 1919, however, Hausmann and Baader were prepared to replace the guiding hand of God with a game of chance, the perfect subject for speculation. 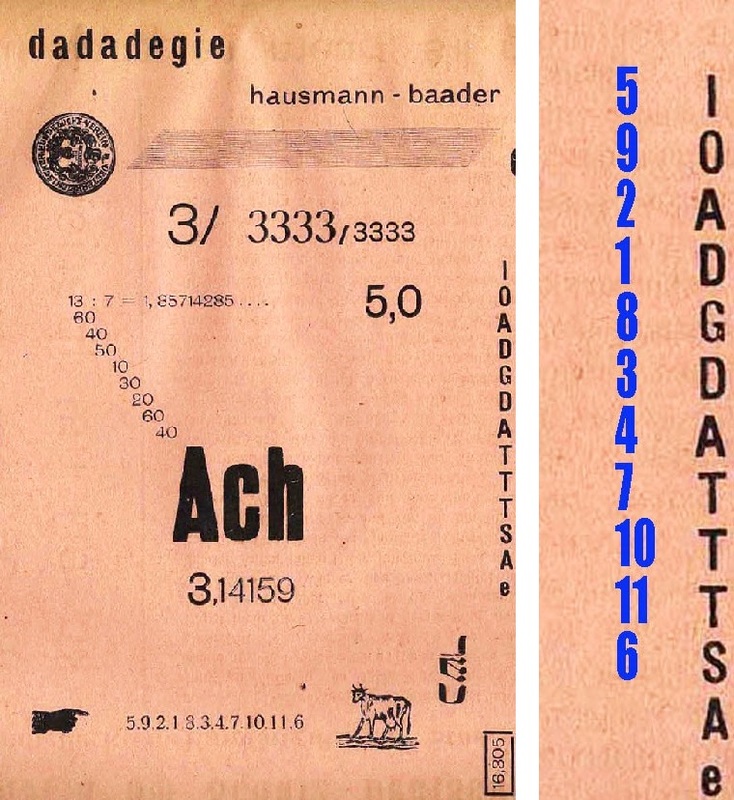 Figure 5: Detail from the front page of Der Dada No. 1. The image on the right reveals the solution to the visual riddle. dada ist die einzige Sparkasse, die in der Ewigkeit Zins zahlt. Der Chinese hat sein tao und der Inder sein brama. dada ist mehr als tao und brama. dada verdoppelt Ihre Einnahmen. dada ist der geheime Schleichhandel und schützt gegen Geldentwertung und Unterernährung. dada ist die Kriegsanleihe des ewigen Lebens; dada ist der Trost im Sterben. […] dada ist die einzige Rettung vor der Sklaverei der Entente. Figure 6: “Legen Sie Ihr Geld in dada an!” Detail from page 7 of Der Dada No. 1. Like many of the articles in Der Dada No. 1, “Legen Sie Ihr Geld in dada an!” walks an uneasy line between satire and sincerity. At first glance, the text reads like an inventory of scams, superstitions, and spiritualist fads. As Anton Kaes has written, “In dem Maße, wie die erfahrene Wirklichkeit rational undurchdringlich erschien, suchte man ihr durch irrationale Zugänge Sinn zu entlocken. Dem Dunklen sollte eine Erkenntnis abgerungen werden, die das Rationale verweigerte” (327). With this in mind, it is tempting to read “Legen Sie Ihr Geld in dada an!” as a simple parody of these irrationalist movements. At the same time, though, Hausmann and Baader were hardly indifferent to the appeal of unorthodox belief systems; Baader was a self-styled prophet who in 1906 had created a design for an elaborate “World Temple” that would “elevate the spirit of the human community by expressing a mystical communal sentiment that went beyond the definitions of all organized religions” (biro 59), while Hausmann took a passionate interest in fringe scientific theories such as the Welteislehre. Seen in this light, the text “Legen Sie Ihr Geld in dada an!” appears less a parody than a pastiche; instead of rejecting these irrational currents (presumably in favor of a restoration of reason), this text revels in them, presenting Dada not as the antidote to irrationalism, but as its purest expression. Also notable in this text is the way that these competing—political, economic, and religious—systems of belief, each of which provides its own way of knowing and relating to the future, are set equal to one another, and are all ultimately reduced to economic terms. Tao, Brahma, political salvation, all of these can be understood in terms of earnings, investments, and interest payments. And Dada itself becomes the symbol of this unifying principle—the one promising investment for a future in which everything is subject to speculation. Previous discussions of Dada’s relationship to German inflation have highlighted two key angles: first, the parallel between Dada’s “nonsense” and the increasingly meaningless status of money; and second, the real economic circumstances of artistic production in an inflationary age. In his article “Excess-Zero. Dada and the Logic of Inflation,” Arndt Niebisch focuses on the former aspect, citing a passage on Dada from the conservative cultural critic Hans Ostwald’s 1931 Sittengeschichte der Inflation. Ostwald writes: “Die Sinnlosigkeit der Inflationsjahre offenbarte sich am deutlichsten in einigen Erscheinungen auf dem Gebiet der Kunst. Am grellsten machten sich die Dadaisten bemerkbar. […] So offenbarten sie die tiefste Sinnlosigkeit der Welt als ihren höheren Sinn” (205-06). Niebisch develops this parallel further, placing particular emphasis on the breakdown of signification, both in language (for Dada) and in currency (for the culture at large): “The production of meaningless signification in Dada poetry coincided for [Ostwald] in the fact that the signifying power of a paper bill also was not stable anymore” (Niebisch 12). A prime example of this sort of “meaningless signification” is Hausmann’s Lautgedicht “kp’ eri um,” which appears on the second page of Der Dada No. 1 (Fig. 7). Consisting of strings of letters with no apparent meaning, and intended to be performed aloud, this poem exemplifies a language that has lost all reference, and thus has no more meaning than money at the height of hyperinflation. 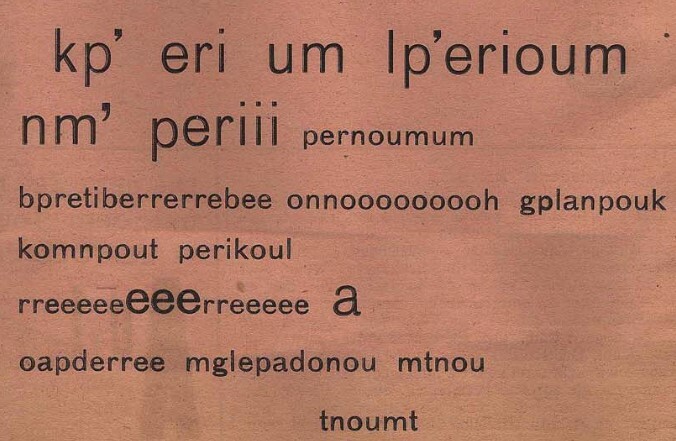 Figure 7: Hausmann, “kp’ eri um.” Detail from page 2 of Der Dada No. 1. Many of these investors were drawn not to Dada, but to the Expressionists, whom Hausmann obligingly derided for making a financial killing off of their ostensibly “spiritual” art. With these economic realities in mind, the exhortation “Legen Sie Ihr Geld in dada an!” is not as absurd as it seems on its face. While the word “dada” may be read here as an empty signifier, a parody of other meaningless investments, it also refers more concretely to an actual art movement, one that set itself in critical opposition to Expressionism. Rather than merely criticizing the Expressionists for making art for profit while maintaining a “spiritual” posture, “Legen Sie Ihr Geld in dada an!” ironically advertises the Dada movement as a hedge against future market volatility, and in so doing, shows how even art is implicated in inflation. 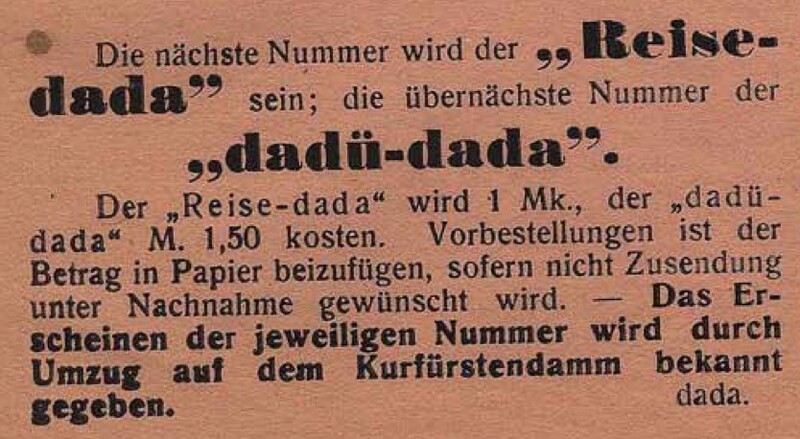 While the two approaches discussed above illuminate important connections between Dada and German inflation, Der Dada No. 1 yields additional, provocative perspectives. Throughout this issue, we not only see the loss of stable meaning and the turmoil of the art market; rather, Hausmann and Baader also show how the uncertainty and speculation caused by inflation spill over into other areas of life. Inflation, this magazine suggests, gives rise to a new a way of understanding and relating to the future, a new attitude towards the future. The future is understood here as a realm of uncertainty, a domain in which the individual cannot hope to gain certain knowledge or exercise real control, but can only seek personal advantage through speculation. The first page, with its jumble of numbers and the article opening “Hirsch Kupfer schwächer,” draws us into a world of financial volatility; but in the remainder of the issue, the speculative stance extends its reach into realms including politics and religion, becoming the defining trope of a new age. On the eve of the Treaty of Versailles, and before hyperinflation had taken hold in Germany, Hausmann and Baader had already foreseen a future that was subject to the law of speculation. A century after Dada began, as we enter another presidential campaign season dominated by polls and predictions, we can clearly see that this speculative attitude towards the future has not faded into the past, but remains very much with us in the present. Baader, Johannes. “Venit creator spiritus . . . . . dada.” Der Dada No. 1. n.p. Web. ————. Das Oberdada. Ed. Karl Riha. Hofheim: Wolke, 1991. Print. ————. Oberdada. Ed. Hanne Bergius. Lahn-Giessen: Anabas-Verlag, 1977. 9–17. Print. Biro, Matthew. The Dada Cyborg: Visions of the New Human in Weimar Berlin. Minneapolis: U of Minnesota P, 2009. Print. Culture and Inflation in Weimar Germany. Ed. Bernd Widdig. Berkeley: U of California P, 2001. Print. Der Dada No. 1. Ed. Raoul Hausmann. Berlin, June 1919. http://sdrc.lib.uiowa.edu/dada/derdada/1/index.htm. Web. Der Dada No. 2. Berlin, December 1919. http://sdrc.lib.uiowa.edu/dada/derdada/2/index.htm. Web. Einstein, Albert. 4 Dec. 1926. No.52. The Born-Einstein Letters. Ed. Max Born. London: Macmillan, 1971. 90-91. Print. “Die feindlichen Blätter meinen…,” Berliner Börsen-Zeitung 22 June 1919. Morning edition, 1. Print. Foucault, Michel. “What Is Enlightenment?” The Foucault Reader. Ed Paul Rabinow. Trans. Catherine Porter. New York: Pantheon. 1984. Print. Hausmann, Raoul. “Alitterel Delitterel Sublitterel.” Der Dada No. 1. June 1919. n.p. Web. ————. “Das Prinzip der universalen Funktionalität und die Welteislehre,” in Scharfrichter der bürgerlichen Seele. 216-18. Print. ————. “Der deutsche Spiesser ärgert sich.” Der Dada No. 2. December 1919. n.p. Web. Hausmann, Raoul. “Von der Macht des Dollarkurses, dem Barometerstand, den Butterpreisen und eines Menschenherzens Elend.” Scharfrichter der bürgerlichen Seele. 161-67. Print. Kaes, Anton. “Die ökonomische Dimension der Literatur: Zum Strukturwandel der Institution Literatur in der Inflationszeit (1918-1923)” Konsequenzen der Inflation. Ed. Gerald D. Feldman et al. Berlin: Colloquium Verlag, 1989. 307-30. Print. Keynes, John Maynard. The Economic Consequences of the Peace. New York: Harcourt, Brace and Howe, 1920. Print. Niebisch, Arndt. “Excess-Zero. Dada and the Logic of Inflation.” rheinsprung11 – Zeitschrift Für Bildkritik, no. 05 (Apr. 2013): 10-21. https://rheinsprung11.unibas.ch/ausgabe-05/thema/excess-zero-dada-and-the-logic-of-inflation.html. Web. Ostwald, Hans. Sittengeschichte der Inflation: ein Kulturdokument aus den Jahren des Marksturzes. Berlin: Neufeld & Henius, 1931. Print. Pegrum, Mark A. Challenging Modernity: Dada between Modern and Postmodern. New York: Berghahn Books, 2000. Print. Scharfrichter der bürgerlichen Seele: Raoul Hausmann in Berlin 1900-1933: unveröffentlichte Briefe, Texte, Dokumente aus den Künstler-Archiven der Berlinischen Galerie. Ed. Eva Züchner. Berlin: Berlinische Galerie,1998. Print. Simmons, Sherwin. “Ernst Kirchner’s Streetwalkers: Art, Luxury, and Immorality in Berlin, 1913-16.” The Art Bulletin 82, no. 1 (2000): 117–48. Print. “Vor der Entscheidung der Nationalversammlung,” Deutsche Allgemeine Zeitung 22 June 1919, Morning edition. n.p. Print. Weinstein, Joan. The End of Expressionism: Art and the November Revolution in Germany, 1918-19. Chicago: U of Chicago P, 1990. Print. White, Michael. Generation Dada: The Berlin Avant-Garde and the First World War. New Haven: Yale University Press, 2013. Print. Although only Hausmann is officially credited as editor of this issue, Baader’s contributions are substantial enough that I will treat the issue as a collaborative product. I am grateful to Timothy Shipe and the University of Iowa Libraries for permission to reproduce images of the International Dada Archive’s copy of Der Dada No. 1, as well as an image from Der Dada No. 2. For the sake of brevity, subsequent references to individual items from Der Dada No. 1 will include only the title and page number (and author, where specified). A complete citation may be found in the Works Cited. Hausmann would take up a similar theme in a text written a few years later, as hyperinflation took hold. Unpublished during his lifetime, this text bears the title “Von der Macht des Dollarkurses, dem Barometerstand, den Butterpreisen und eines Menschenherzens Elend.” Here, as on the front page of Der Dada No. 1, Hausmann explicitly links political turmoil to economic volatility, until at the end of the essay many forms of uncertainty blend together: “ich weiss garnicht mehr, ist das Wetter 170 Mark oder der Dollar 773 Millimeter und die Butter 880 Mark oder umgekehrt.” (165). Cf. also Niebisch 15. To the best of my knowledge, the solution to this riddle has never been published before, though other authors have recognized the relevance of numerology and cryptography: see e.g. White 232. The letters “Ae,” which remain unaccounted for in this solution, can be interpreted as “May 1919” according to Baader’s own calendar, which is explained in Baader, Das Oberdada 45. As White notes, the characters “Ad1,” which appear in the lower right-hand corner of the front page of this issue, just below the riddle, follow the same system, in which “A is the year 1919, d the fourth month, and 1 the day” (231); those characters thus refer to April 1, 1919, the date of Baader’s fictional death. In the second issue of Der Dada, Hausmann would write, under the title “Der deutsche Spiesser ärgert sich”: “Nach einer ungeheuren Verdünnung des Lebensgefühls in ästhetische Abstraktionen und moralisch-ethische Farcen enttauchte dem europäischen Wurschtkessel der Expreßionismus des deutschen Patrioten, der aus einer anständigen Bewegung […] ein kleines profitables Kriegsgeschäft in einer endlos dicken Begeisterung fabrizierte. Der Leierkasten der reinen Dichtung, Malerei, Musik wurde in Deutschland auf einer äusserst tüchtigen Geschäftsbasis gespielt” (2). For a discussion of related criticisms of Expressionism, see Simmons. Cf. also Kaes: “Die Funktionskrise der Literatur ist bei den Dadaisten selbst zum Thema erhoben worden. Durch Parodie klassischer Kunst, Nonsens und gesuchte Primitivität attackierten sie bildungsbürgerliche Erwartungshaltungen und weigerten sich, die Literatur eine sinnstiftende Bedeutung zuzuweisen” (316).